I put up a chart yesterday (previous blog) inspired by George Markides' work on tracking down the use of ECB Emergency Liquidity Assistance to prop up Laiki and the Bank of Cyprus (Note: the FT has reported that BofC had €1bn of ELA). ELA has become important in debates/policy action in the Cyprus bailout for two reasons. One is the sheer scale of the ELA operation at €10bn (equivalent to over half the size of Cyprus's GDP) and the burden this now represents as its sits in the balance sheet of the new Bank of Cyprus/good Laiki bank. The other is the argument that the ECB and CBC should not have allowed ELA to be used to prop up what was in effect - according to proponents of this analysis - an insolvent bank. They argue that the ECB/CBC should have pulled the plug on Laiki bank in 2012 thus saving Cyprus a load of money (I'm not quite sure how the math, as they say over here, works on this.) (Worth noting that Laiki's auditors expressed 'going concern' issues in their report in the 2011 Annual Financial Statement). In passing, I wondered if maybe a reason that the 'plug' was not pulled on Laiki, if it was insolvent in 2012, was due to the fact that up until the March 25th 2013 bailout Cyprus did not have bank resolution legislation. As I recall this was adopted as an off-the-shelf copy of English law in the hectic parliamentary session between the two bailout atttempts. Could this lack of legislation have been used as another form of pressure on the supposedly independent CBC by the president and parliament to forestall a plug pull? Turning to the thorny issue of ELA George Markides has posted some useful comments to my previous blog entry below. If I understand him correctly he is saying that banks can fund their liquidity or funding shortfalls through three mechanisms (there are more - bonds, share issues etc but let's park them for now). The cheapest and least conditional source of liquidity and-stop gap funding is through money markets that operate on trust and do not require collateral. These interbank money markets froze-up in the banking crisis and destroyed some banks (like Northern Rock) that had business models based on meeting the shortfall of their assets over liabilities through money market operations. When the interbank markets froze the ECB stepped in with a massive loan facility (is this the same as the Long Term Refinancing Operation?). Banks could arrange collateralised borrowing from this fund. The interest they were charged was dependent on the quality (risk-weighting) of their collateral. Emergency funds were also available as a last measure. These could use forms of collateral not acceptable in the LTRO ECB loan facility. But banks using ELA incurred higher interest rates (and charges?) than the LTRO or interbank market operations. This snapshot at June 30 2011 prepared by the IMF from CBC data shows that the commercial banks (Laiki, BofC and Hellenic) had a surplus of €4.3bn of deposits over loans.But there were deficits in the loans to Cyprus residents sector (-€5.7bn) and the Greek sector (-€6.1). These were more than balanced by the surplus in the Cyprus lnon-residents sector (€17.5bn). In passing it is also worth noting that loans to Greece made up 44% of the commercial banks total loans (see Column G for what 'total' means here) and 29% of deposits. Returning to the chart I posted yesterday I have now simplified this to show just 'Lending to euro area credit institutions related to monetary policy operations' (ECB LTRO? ), 'Other claims on euro area credit institutions' (aka ELA) and total assets/liabilities. This shows LTRO fund borrowing in 2011 relatively steady around €5bn. Then in March 2012 there is a vertiginous rise in ELA borrowing. George Markides in his comments below in the previous blog says that this was due in effect to the decay of the collateral used by the commercial banks to secure LTRO - firstly through the Greek government bond PSI (Private Sector Initiative) haircut which reduced bonds to junk status and then by downgrading of Cyprus government bonds to junk (see his chart of ELA take-up which I have reproduced below). Why the extra ELA requirement above the LTRO conversion total? However if LTRO was in effect just being swapped on a Euro for Euro basis - at considerable cost - for LTRO funding the ELA (red line) would not have exceeded the LTRO (blue line above) would it? Instead ELA funding shoots beyond the €5bn of LTRO funding eventually reaching €11.4bn in March 2013. 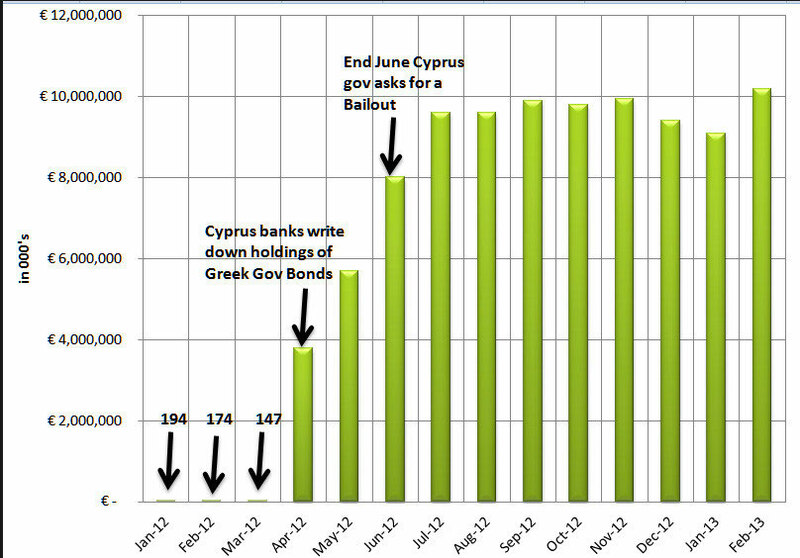 Some Laiki ELA data has been posted on a page on Cyprus.com of bailout materials. I do not know if this data can be trusted but it purports to show the weekly balance of Laiki bank ELA uptake from September 2011 to March 2013 when the ELA facility drawn down by Laiki had reached €9.4bn (which, in passing, leaves €2bn of the 11.4bn total in the CBC March 2013 balance sheet unaccounted for - €1bn for Bof C and?). For each week of the Laiki data a 'main reason' is given for the ELA transaction. Along with 'lower value on ECB collateral' the other main reason for ELA uptake is 'deposit outflow'. This suggests that Laiki was not only replacing LTRO with ELA but also funding a liquidity gap between loans and deposits as deposits flowed out of the bank. a vivid picture of the bank’s deteriorating situation and the contribution to this of bad loans and deposit losses in Greece. • Cyprus operating revenues increased of 14%. • Q2 2012 Non-Performing Loan ratio in Greece 32.6% (13.6% increase). I think what this shows is that the rise of the red ELA line above the blue LTRO line in the chart above is due to the haemorrhaging of deposits (22%) 'mainly in the Greek market'. I have argued in my paper Not so lucky Laiki (post below and here) that it is really incredibly inconsistent and unfair that uninsured depositors in Laiki and BofC in Cyprus are being massively haircut whilst Greek depositors in the same banks get off scott-free. The evidence accumulating here also suggests that it is massively unfair and inconsistent that ELA funding that was keeping the Greek operations of the Greek-led Laiki bank solvent now weighs so heavily on the shoulders of the remnant banking system in Cyprus and its resident (and non-resident) depositors on the island. Before closing this blog here are a few more questions? 1) Why did Laiki have such huge recourse to ELA compared to the Bank of Cyprus? Was this due to differential exposure to Greek deposit withdrawal? Greek haircut? Strange that LTRO funding stops for all banks from Nov 2012. 2) Why does the shift in Laiki's obligations to Central Banks in Greece and Cyprus not show up in the data in the chart above? Update Note 29 April 2013: I have added 2009 figures to Tables 2 and 3 below to check that the 2010/11 figures were not an aberration. They were not. This section of the paper looks at changes in Marfin Popular Bank/Laiki’s obligations to other banks between 2010 and 2011 – that is, pre and post- the MPB/MEB merger. 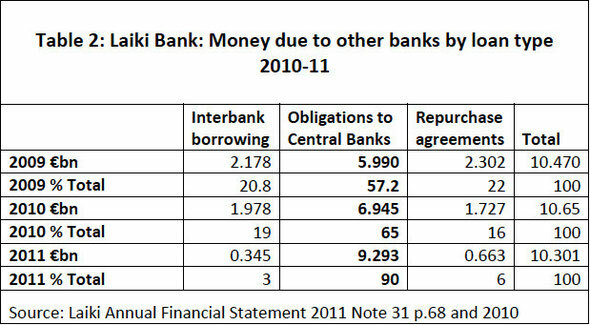 Table 2 below the distribution of MPB/Laiki money due-to-other-banks between interbank borrowing, obligations to Central Banks and repurchase agreements for 2010 and 2011. It can be see that while total due-to-other-banks falls slightly the percentage of that total accounted for by obligations-to-Central-Banks rises dramatically from 65 to 90 per cent from €6.9bn to €9.3bn. Table 3 presents figures for the geographical spread of money due-other-all-banks 2010-11. Greece and Cyprus are the predominate location of these obligations. 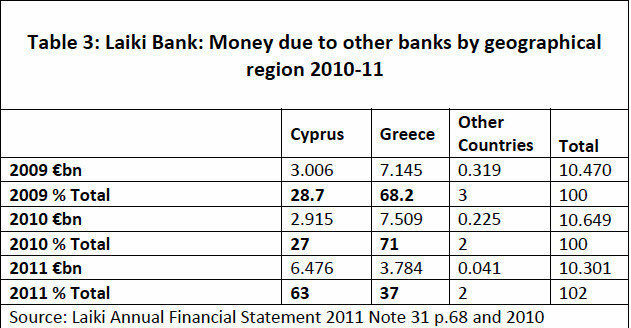 The figures show a massive shift in the location of money due-to-other-banks from Greece to Cyprus between 2010 and 2011. In 2010 the Greek operations of MPB/Laiki account for 71 per cent of the bank’s money due-to-other-banks. A year later the Greek operations of the bank account for just 37 per cent of total money due-to-other-banks while the Cyprus operations account for 63 per cent it. Combining data from the two tables above we can see in Table Two that in 2010 MPB/Laiki owed €6.9bn to central banks and that the total of money due-to-other-banks in its Cyprus operations in 2010 was €2.9bn. This suggests that in 2010, other things being equal, the Cyprus operations of MPB/Laiki owed a maximum to the Central Bank of Cyprus of €2.9bn. After the merger of Marfin Popular and Egnatia Banks that took place on 31 March 2011 the maximum amount that the Greek operations of the combined bank could owe to Greek Central Bank had been reduced to from €4.03bn to €3.783bn. Even though the total obligation to Central banks had risen from 65 to 90% of all money due-to-other-banks. At the same time the Cypriot operations of the combined bank now had obligations to the Central Bank of Cyprus of at least €5.5bn – up from a maximum of €2.9bn the previous year. It is my contention that these figures suggest a massive shift of obligations to central banks within MPB/Laiki from its Greek operations and the Bank of Greece to its Cyprus operations and the Central Bank of Cyprus between 2010 and 2011. This would after all make sense in that with the transformation of the Greek-based MPB/Laiki subsidiary Marfin Egnatia Bank to a branch it lost its banking licence and hence its ability to borrow from a Central Bank (for MEB’s loss of bank licence see Alvarez and Marsal report). It is strange that this shift in the Central Bank obligations of MPB/Laiki that appears to be a consequence of the MPB/MEB merger is not picked up in the Alvarez and Marsal report. I have tried to trace it in the monthly balance sheet reports of the Bank of Greece but the figures for Lending to/liabilities to euro area credit institutions are presented at aggregate levels and vary considerably month-to-month. Subsequently it was revealed that Laiki Group had Emergency Liquidity Allocations of €9.2bn that were transferred from Laiki Group through the resolution process to the Bank of Cyprus. It is reasonable to believe that most of the ‘obligations-to-central-banks’ shown in Table 2 above were in large part made up of Emergency Liquidity Allocations made by both the BOG and CBC that eventually totalled €9.8bn when Laiki was ‘resolved’. By then, of course, all of this allocation had been extended by the CBC while none of it came from the BoG.